At university you may be asked to give presentations. You might be asked to work with others to produce a group presentation. In some cases, your presentation will be assessed. Presentation skills are likely to be useful in your career too. 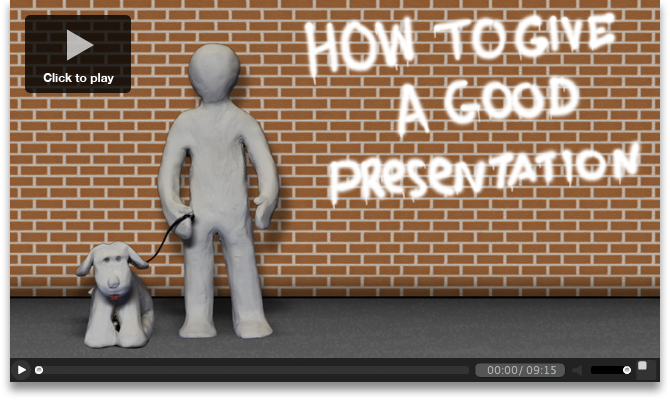 This section looks at how to improve your presentation skills. I'm Helen Prance. I am an electronics engineer in engineering and design. I teach a course in the autumn term of Year 1 to all of our new students, which introduces them to where technology is now. As part of it, they are assessed by an individual oral presentation. So what I am going to talk about is oral presentations in general, because they are used widely across the university, and what you should think about if you are asked to give an oral presentation. Why would you be asked to give an oral presentation? There are a couple of reasons that we use oral presentations. The most obvious one is because it is very important that, as part of education, students learn how to present themselves as individuals, verbally, in public - for many future applications: interviews, talks, whatever. So we want to make sure that students have got the skills to do that. The other aspect of it is that it's a very good way of assessing an individual's understanding of the material because they have to present it and explain it themselves and therefore have to understand it themselves. So it is something that comes up across a lot of university programmes, and the assessment criteria will usually include, certainly the aspect of, how do you present the information verbally in public? It can also include the contents: whether you did the research; how you understood the material. But it will also include, as I say, the way you presented the material: the way you come over in a sort of performance. Those are the 3 key things that you have to think about. So A for audience. When you are considering the presentation you are going to give it is absolutely vital that you think about the people that you are going to be talking to. You need to think about: who they are going to be; why they're there listening to you; what they want to hear from you; and how much they may know about whatever it is you are going to say. For example, you might have some material that you've presented on a number of occasions, to different audiences, but you should never present it in exactly the same way because what one audience wants to hear, and what they know, and the way they listen to you, is going to be different to another audience. So that is the first thing about audience: why they are there. The other aspect when you think about your audience is: how are you going to engage the audience? How are you going to keep them with you in a sort of dialogue but where you're doing the speaking and they're responding by listening and reacting to what you are saying? So you need to think about the way you project your voice, the way you maintain eye contact with people in the audience, the way you're sensitive to whether they are following what you are saying, whether they want to ask a question or you need to go over something again because they haven't followed. If you can do that, then the audience will empathise with you; and they will listen to what you say and they will want to hear you say more and they will follow you because they will know you've thought about them. So that is the A: the audience. The next letter is C and I said it was for clarity. That means the clarity of the content of what you are going to say. The way that you make that content clear is through the structuring of your presentation, maintaining interest throughout the presentation and understanding what you are presenting and explaining it to your audience. So the best way to structure a presentation is to start by making the audience understand what you're going to be telling them and how you are going to go about doing it because then they have a map ahead of them, they can see how you are going to use the time ahead and can see what they can expect you to be covering. The map at the beginning sets the structure and throughout the presentation, and this can depend upon long it is. You need to keep referring back to that map and keep the audience following this route through what you are presenting. The way to maintain interest is to remember something which comes across a lot in the guidance, which is the audience will start off interested because you're a new person and what is this new person going to say to us? Then inevitably towards the middle of the presentation, if you do nothing about it, their interest will dip. You need to do something to bring them back again and there are lots of techniques, lots of guidance about different techniques, to pull that dip up in the middle. Towards the end their interest will raise again because they will be coming to the end and they know your time is nearly up and they're thinking about questions they are going to ask and all sorts of things. So their interest will rise again at the end inevitably because they know the presentation is coming to an end. What you have to do is pull that central dip up through various techniques and again if you empathise with your audience, if you've followed whether they are staying with you, then you will keep knowing the cues to keep that interest up. The other part of clarity is, do you understand what you are talking about because there is no way you can make an audience understand whatever the material is if you don't understand it yourself. In general it is a very bad idea to talk about something you don't really understand because an audience will rapidly pick up on the fact that you do not understand it. There are exceptions to this. Occasionally you may present something you don't understand if your purpose is to ask the audience to help you understand it. This is particularly true in research or in a research-based project where maybe something occurred that you couldn't fully explain but you can present it to the audience and say: ‘this is still not fully explained but perhaps you might have some ideas' and that is fine as long as you are honest with them. It is that clarity of understanding that is very often being assessed because, as I say, it is very hard for an individual to verbally help people understand things if they don't and therefore it demonstrates how much you understand. So those 3 things, the structure, the interest and the understanding, together give the clarity of the presentation. The final letter of act is T and that is timing, and it is exactly what it says. You will always be given a length of time to fill, to speak for, and very often it will be a length of time, possibly with some time additional for questions or a length of time including questions, but usually you are told how long you are going to speak for. It is imperative that you use that time. If you're familiar with the story of Goldilocks, you don't want it to be too short, you don't want it to be too long, you want it to be just right. Too short is not such a problem for the audience. They might feel short changed if it is very short but they won't usually feel disgruntled or irritated by a short presentation. But if you're being assessed on a presentation, then whoever is assessing it will feel disgruntled because they will feel that you could have used more material or explained it better or structured your talk better to use the time you were being given. So you will not do well on your assessment if you speak for too short a time. Too long is the thing that really upsets an audience. They will know how long you are supposed to take. They may well have to listen to other presentations after you and they know that if you go on too long the next person will start late and they could go on too long and you could all still be here by the end of the day. It is almost a form of bad manners to take more time than you were supposed to over a presentation. So just as you thought about the audience before you started preparing the presentation, you think about ‘how long have I been given?' The amount of material and the way you present it for a 5-minute presentation will be different from a 10-minute, will be different from a half an hour, will be different from a 50-minute lecture. All of this comes with practice. You learn how much you can present in a given time and, if it is your first attempt at an oral presentation, the way you get practise is literally by practising it: practising to your mirror, to your friend, to your dog. Time yourself and if it comes out too long or too short then change the presentation. Don't think I must go faster or I must go slower and fit it. You change the presentation, you change the number of slides you are using and then practise again and see if it works. That way you will do the just right timing, you will achieve a good assessed result and you will make your audience, above all, very happy with you. There are a number of other aspects associated with oral presentations which may well be specific to the particular course that you're doing. So some courses may require you to use PowerPoint as a visual aid, some may require you to give handouts or allow time for questions, but what you need to remember is that you will always be provided with guidance on these aspects. This can come in the form of information on course websites, Study Direct [now Canvas], guidance through the many communication skills textbooks that there are in the library and the bookshop, online resources about the best way to use PowerPoint (which is very contentious; some people love it some people hate it) but it is very often used. Links to some of this guidance will be provided on the S3 [now Skills Hub] website to help you find it. But you should also use whatever guidance your course lecturer suggests you should use and follow it and think about the aspects as you are practising in front of the mirror with your watch and your notes to make sure you're performing and acting with your A C T in the best way you possibly can. The webpages in this section of the website have been adapted from How to give presentations and How to do a presentation.